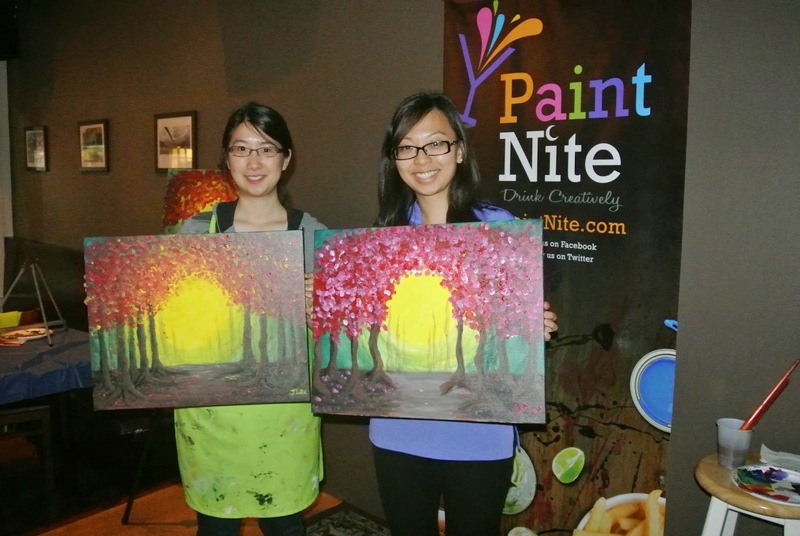 A couple of weeks ago, W.W. and I participated in a night of painting at an event called PaintNite. I saw it on Groupon and looked at the paintings and I thought they were pretty nice looking. 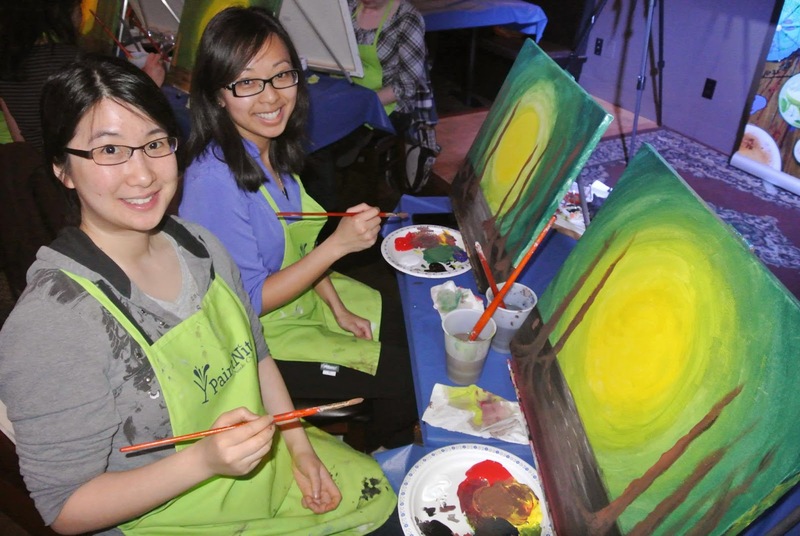 They host these painting classes all over Vancouver at different restaurants and pubs so that you can eat and drink while painting. You can choose which painting you'd like to attempt and sign up. It costs $25 with the Groupon. We choose the painting "Fall Sunset" and the event was hosted by artist Stephanie Larson at Mr. Brownstone on Main Street. The reference painting is above. Stephanie guided us step by step on how to recreate this painting. 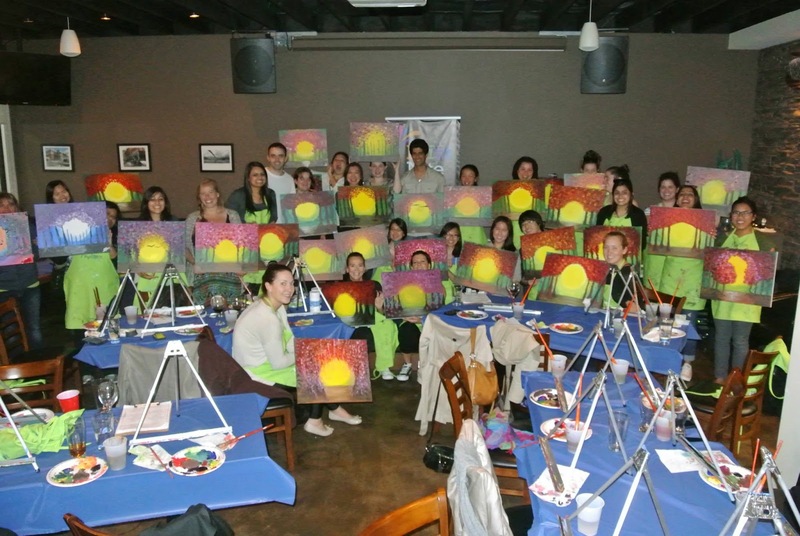 We each started off with a blank canvas and a plate of paint. Primary colours, black and white. We had to mix colours on our own. Painting the ground. After this, I got so into painting, I forgot to take more in progress photos. Haha this happens when I'm digitally painting as well. However, in Photoshop you can turn on and off the layers! Can't in real life. And there is no undo button! But I guess it is the imperfections that make art interesting. Our instructor went around throughout the night taking everyone's photos. Ooo my paint plate was such a mess at the end. Obviously, my paint mixing skills need some work. I had a great time; it was nice to relax and paint after work. I thought it was very therapeutic. I may attempt to paint some more on my own!